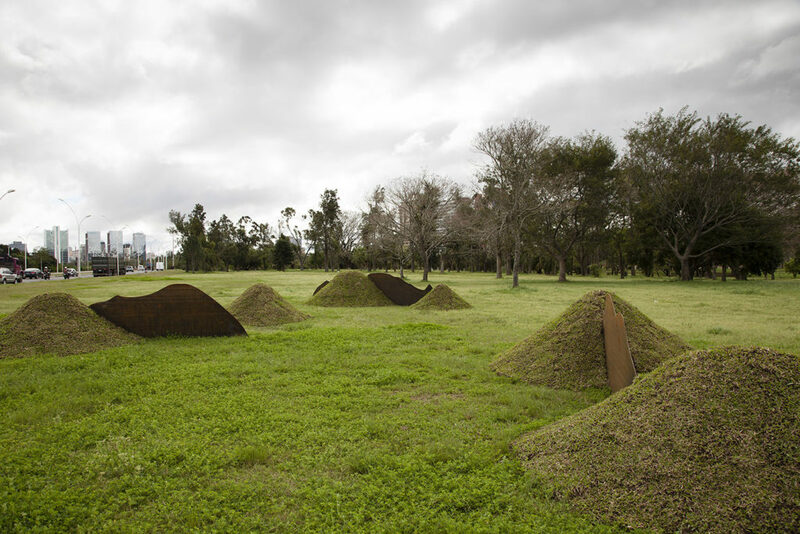 Three two-dimensional, hill-shaped pieces of metal perpendicularly piercing some artificial small-size grass hills positioned in the public park, Parque da Marinha, in Porto Alegre: this public art installation recalls the idea of artificial mapping. Three hills (2016) is indeed a transposition of a description of a city. The artist Marina Camargo offers her cognitive map of Porto Alegre, situated in southern Brazil, rearranged into a fictional landscape in a public park. As pointed out in the book The Image of a City (1960) by Kevin Lynch, the city as an object itself is considered differently from the outside than the same urban space as perceived by its inhabitants. The artist indeed draws attention to the invisible landscape of inhabitants of the place by encouraging the process of image-making and the awareness of the perceived shape of their own urban environment. In his essay, the geographer examines the fragmentary and ever-evolving meaning of a city as it is influenced by personal concerns and experiences, highlighting the extent to which mental pictures gain identity and organization through familiarity. In this regard, it is interesting to notice the contrast given by the work itself as a permanent installation and the expected distortion of its own meaning. Lynch also suggests identity, structure, and meaning as the three components to be considered while analyzing a space; components which in reality always appear intertwined, blurred together and converging. The grass hills are distinct from the rest of the lawn; they own an identity, they occupy a spatial pattern, and, as one walks around them, a practical or emotional meaning in development emerges: what Lynch called imageability, or rather, the physical quality evoking strong image sensitivity in any given observer. Camargo’s work also elucidates how strongly the image creation is a two-way process between the observer and that which is being observed. There are various contrasts in the work. First of all, the material of the two-dimensional metal contrasts with the grass of the park. Second, as a piece of public art, the work serves as a landmark in the city by definition. Third, the soundscape, as defined by Michael Bull, seems to be out of place as there is neither the sound of traffic nor the inhabitants of the city. Lastly, if we think of cartography where streets are perceived as guides going towards something or leading somewhere, in this work we are facing a freeform unconfined tool to measure the space, suggesting other explorative possibilities while thinking of the space a city encompasses, for example, encircling the circumference of the park. Text originally published at Art & Tours – Art in Plain Sight.